As an Uber driver-partner, you’re an independent contractor, not an Uber employee. The difference is huge, especially at tax time. Follow these tips to report your income accurately and minimize your taxes. If you’re one of the thousands of people who started driving with Uber this year, it might be the first time you’ve been your own boss, setting your own hours and making countless decisions to improve the performance of your business. It also might be the first time you’ve had to report self-employment income on your tax returns. As far as Uber is concerned, you’re an independent contractor who provides a service, not an employee. That’s why Uber does not withhold taxes from your payments. It’s also why the company reports your earnings on 1099 forms, rather than on a W-2. Form 1099-K reports the total amount your passengers paid for the rides you provided. This includes all the money you collected from passengers, including the Uber commission and other fees. As a result, the amount shown on Box 1a of the form is greater than the amount you actually received. However, you can usually deduct the additional fees as business expenses, so you pay taxes only on what you earned. Form 1099-MISC provides an accounting for any other income you’re paid, including referrals and non-driving-related bonuses. The IRS rules do not require Uber to issue a 1099-K if you processed fewer than 200 transactions or earned $20,000 or less in payments. Likewise, Uber is not required to provide a 1099-MISC if your non-driving income was less than $600. Even if you don’t receive a 1099, you are still required to report your ridesharing income to the IRS. You will most likely report the income from your 1099s on Schedule C, Profit or Loss from Business. Since Uber reports this income information directly to the IRS, you do not have to include the actual 1099 forms with your tax return. Schedule C can also be used to list your business-related expenses. When you subtract your business expenses from your income, you will enter the difference—known as the business income or loss—on line 12 of Form 1040. This income amount is also used on Schedule SE, in calculating your self-employment taxes (for Medicare and Social Security). To get you off to a good start with your business tax deductions, Uber provides you with a tax summary that breaks down the totals of both your 1099-K and 1099-MISC. The tax summary shows the total amount your passengers paid for Uber booking fees as well as other fees, such as tolls, other booking fees, and split fare fees. You can list these fees as business expense deductions on Schedule C so you do not pay taxes on them. The Uber tax summary of total online miles includes all the miles you drove waiting for a trip, en-route to a rider, and on a trip. You can claim any other business-related mileage, such as the mileage you drove to ride requests, the mileage you drove after dropping off the passengers if you are waiting for another ride, and the mileage you drove before rides were canceled. However, you must keep careful records of you off-trip mileage. You can deduct the actual expenses of operating the vehicle, including gasoline, oil, insurance, car registration, repairs, maintenance, and depreciation or lease payments. Or you can use the standard IRS mileage deduction. For the 2018 tax year, that rate is 54.5 cents/mile of business use. Your expense equals $5,450 (10,000 X $ 0.545 = $5,450). 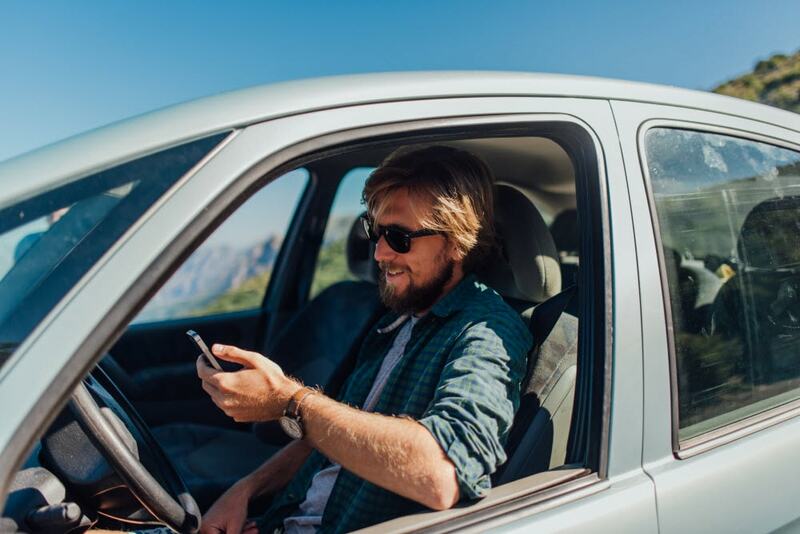 If you use the same vehicle for both your ridesharing business and your personal transportation, you must keep accurate records to separate the two uses. You are allowed to deduct only the expenses that apply to the business use of your car. The IRS can disallow any business expenses you can't support with mileage logs, receipts, or other documentation. As with your car, you are only allowed to deduct the portion of your smartphone expenses that are related to your business use. For that reason, many Uber driver-partners purchase a new phone and dedicate it solely to their business. That way, 100% of all costs associated with that phone are deductible from their taxes. Remember, with TurboTax Self Employed, we’ll ask you simple questions and fill out all the right forms for you to maximize your tax deductions. Uber does not offer tax advice. Please refer to TurboTax for additional information. Uber is not responsible for the products or services offered by third parties.